UU senior Megan Beachy (pictured) averaged 9.1 points per game last season. The Blue Knights open the season at home today at 6 p.m. versus Tiffin. 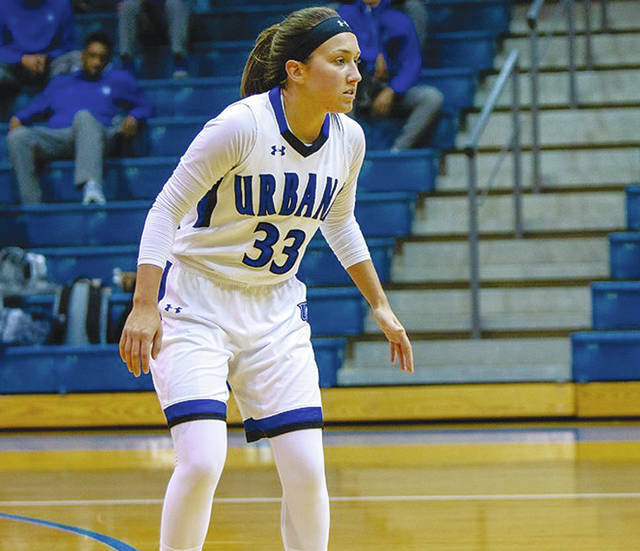 The Urbana University women’s basketball team will open its season today by hosting Tiffin at 6 p.m. Since 2003, the series between UU and Tiffin is tied 5-5. Tiffin has won three straight over UU, including both meetings last season. UU won the last meeting at the Grimes Center on Jan. 9, 2007 (64-55); overall, the Blue Knights are 3-1 against the Dragons at home. Andrea McCloskey enters her second season at the helm of UU women’s basketball and ninth season overall as a head coach (128-109) … the Blue Knights are coming off a 12-15 season (10-12 MEC) … UU went 9-3 in home games during the 2017-18 campaign with 10 of those games decided by 10 or fewer points … two of the squad’s top three scorers return in junior Sylvia Hudson (16.6 ppg) and senior Megan Beachy (9.1 ppg) … Hudson ranks second among NCAA Division II active career leaders and first in UU women’s basketball history in field goal percentage (61.5) … Hudson, who was named All-MEC Honorable Mention last year, has 18 career double-doubles while averaging 15.4 points and 8.1 rebounds during her career… Beachy is third in program history in made three-point field goals (148). UU will replace three starters from a year ago with eight returning letterwinners and six newcomers … only three returners averaged more than 15 minutes last season (Hudson, Beachy, Erin Morrow) … UU led the MEC in free-throw percentage last year (76.6) and finished fourth in team field-goal percentage (42.5); however, the Blue Knights were last in team three-point shooting (27.3) … Last year, UU finished 8-4 in games when holding a lead at halftime and 5-10 when trailing at the midway break. UU opens conference play this weekend at UVa-Wise (2 p.m. – Saturday) and Concord (1 p.m. – Monday). The Blue Knights will travel to Findlay on Wednesday, Nov. 21. CLEVELAND – Cleveland State beat UU, 94-65, in a men’s basketball exhibition game Tuesday night. Datrey Long scored 15 points for the Blue Knights, who play at UVa.-Wise on Saturday at 4 p.m.
https://www.urbanacitizen.com/wp-content/uploads/sites/36/2018/11/web1_beachy.jpgUU senior Megan Beachy (pictured) averaged 9.1 points per game last season. The Blue Knights open the season at home today at 6 p.m. versus Tiffin.